On arrival in Santa Clara, you’ll be met and escorted to the Hotel Central Encanto. With only 23 guestrooms, General Tours charming hotel enjoys a privileged location among the Colonial and Neoclassical landmarks that overlook the town’s main square. A guided evening walk with a local historian is the perfect introduction to Santa Clara and its monuments. The Battle of Santa Clara in December 1958 was a turning point in the Cuban Revolution. This morning you’ll explore these historic events and the man behind them at the Che Guevara Memorial. Here you’ll find a small museum, Guevara’s mausoleum, and an 82-foot statue of the revolutionary. Then explore earlier chapters of history in the quiet, rarely-visited town of Sagua La Grande. Founded as a Spanish settlement, its neo-classical architecture reflects the wealth gained from the sugar industry. General Tours People-to-People activity with a journalist and Rumba troupe promises insight into the region’s Afro-Cuban heritage. Departing Santa Clara after breakfast, General Tours travel southward into the Valley de los Ingenios . This UNESCO World Heritage Site bears testimony to the development of the island’s sugar cane industry. In the early 19th century, there were 11,000 slaves working here on the plantations and sugar mills. Learn more about this history as General Tours guide shows you the ruins of these mills, the old slave quarters and some of the restored homes of long-ago sugar barons. Then check in to the stylish Iberostar Grand Hotel Trinidad, a pistachio-colored landmark overlooking Plaza Carillo. You’ll have time to explore on your own, perhaps stopping in a café or bar for a refreshing Cuba Libre or Mojito; General Tours guide will be happy to offer suggestions. This evening you’ll dine at La Redaccion. Set in a restored Colonial residence, it offers daily-caught seafood and organic farm-to-table fare. A local journalist will join us for dinner – ensuring lively conversation. 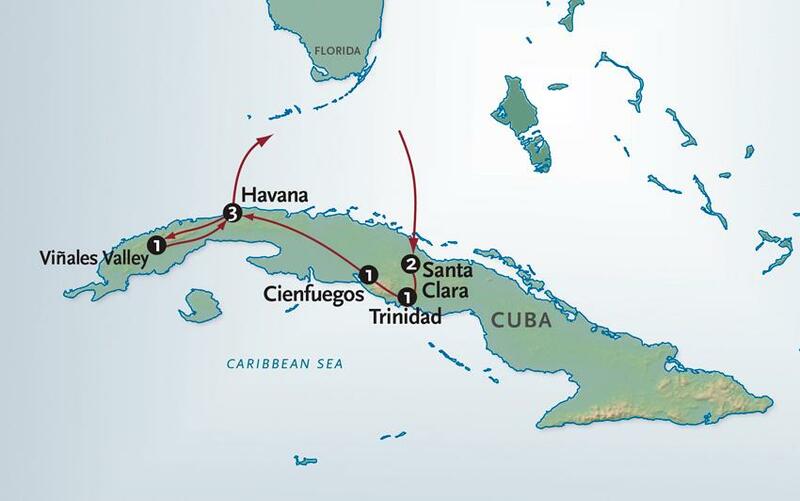 Leaving Trinidad this morning, we’ll enjoy a scenic drive to Cienfuegos. Established in 1819 and known as the “Pearl of the South,” this is one of the island’s newest settlements. It’s also a UNESCO World Heritage Site, recognized for its architectural diversity. You’ll discover a fine Colonial district and a collection of early 20th-century villas. We’ll begin General Tours touring at the Cienfuegos Botanical Garden. Established in 1899 by a New Englander named Edward Atkins, the garden began with a collection of rare plants which this wealthy sugar tycoon cultivated on his own estate. In the heart of town, General Tours walking tour focuses on the historic buildings that overlook Jose Marti Park. We’ll also join residents along the colorful commercial streets and in the markets of town. It’s another chance to experience life in Cuba. At the Palacio del Valle, we’ll discover an architectural gem set at the end of Punta Gorda – a slice of land that extends into the bay. Built in the early 1900’s with colonnaded balconies and turrets, it reflects Spanish, Moorish, Gothic and Baroque styles. At midday, a boat will take us to a nearby fishing village where we’ll enjoy a seafood lunch. Back in town, we’ll head to the Tomás Terry Theater, easily recognized by the gold-leafed mosaics that adorn its façade. The interior of this 950-seat theater features Carrara marble, hand-carved Cuban hardwoods and ceiling frescoes. As part of General Tours People-to-People program, enjoy an enriching conversation and a private concert with members of the renowned Cienfuegos Choir. After breakfast, we’ll travel to Havana. With General Tours unique approach, your sightseeing begins on a ferry as General Tours take you across the harbor. Away from the hustle-and-bustle of Old Havana, where most visitors begin their exploration, you’ll have a better introduction to the city’s centuries-old seafront forts and its history as a vital trading port. Stepping ashore in the quieter lesser-visited district of Regla, we’ll delve into the city’s enduring Afro-Caribbean traditions. One example we’ll learn about is Santeria, a local religion that blends elements of Roman Catholicism with Yoruba beliefs that trace their roots to Africa. Then we’ll get another taste of the island’s music scene at a recording studio that has attracted a wide variety of musicians. These include Dave Matthews, Smokey Robinson, and some of the island’s top hip hop artists. After lunch at Doña Eutimia, we’ll enjoy a walking tour through Old Havana. Immerse in the rhythms of city life and learn about the Baroque and Neoclassical monuments of this UNESCO World Heritage Site. General Tours tour will take you through the city’s four principle town squares – from the charming Plaza de San Francisco and impressive Plaza de la Catedral to Plaza Vieja and the lively vendor-filled Plaza de Armas near the waterfront. Then we’ll check in to the deluxe Iberostar Parque Central in the heart of Havana for a 3-night stay. You’ll have time to refresh before General Tours head out to enjoy General Tours first night in this energetic city. Then continue to El Morro, Havana’s harborfront fortress, we’ll have views of the city and the fortress on the other side of the harbor. Close to El Morro, an open-air military museum is home to Soviet weapons, including some of the missiles that factored into the 1962 military standoff between the U.S. and Soviet Union. Next, General Tours head to Cojimar, the seaside village that inspired The Old Man and the Sea. It was from the Cojimar pier that Hemingway would set out in his 38-foot fishing boat to make liquor runs to Florida. The roots of Rumba music and dance can be traced to the slave trade that brought these traditions from Africa to the Caribbean. What General Tours in America now consider to be Rumba is most closely associated with several genres that have long been popular in Cuba - including Guaracha and Son. This morning, we’ll delve into this fascinating history with a special People-to-People activity in a family apartment in Old Havana. In the company of a Rumba professional, this lively morning exchange will of course include a dance lesson for those who wish. Next, we’ll head to Callejón de Hamel. Adorned with bright murals and sculptures, this narrow alley in Central Havana has emerged as a thriving community project devoted to Afro-Cuban music and dance. Around midday, we’ll visit a market, grocery store and ration card facility to learn more about daily life and how food prices are determined. Over lunch at Grados, a traditional Cuban paladar, the owner-chef will share personal stories about his recipes and food – much of it drawn from the home-cooked meals of his childhood. This afternoon delve into Cuban history before and after the Revolution – from the infamous 1950’s mobsters who spent much time at the elegant Hotel Sevilla to the monuments of Revolution Square. We’ll also visit the Museum of the Revolution, set in the former Presidential Palace. The region is also the island’s tobacco heartland and we’ll spend General Tours first few hours delving into the generations-old farming techniques that produce some of the world’s finest cigars. From the plantations and their working livestock to the tobacco drying houses, we’ll learn much about this vital sector of Cuban agriculture. A local farmer will even teach us how to handroll a cigar with techniques that have changed little over the generations. *Each of General Tours people-to-people departures is individually arranged. Your final itinerary may vary slightly as venues unexpectedly open and close.